Afraid of getting sick in Vietnam? Follow this guide for eating and traveling. One of the fastest ways to ruin a vacation is by falling sick! As a traveller in a new country, it can be difficult to know what to eat, what to drink, and how to go about your activities while staying as healthy as possible. 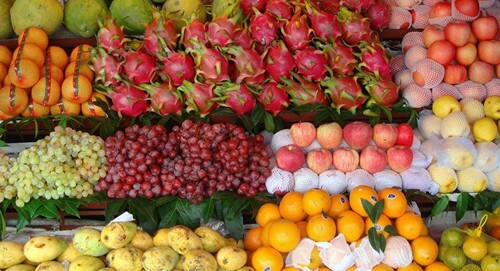 Here are some great tips on how to stay healthy during your time in Vietnam. Besides health, another headache for tourists are the various scams here. There are dangerous tours (thankfully there are safe food tours too), questionable places to eat, there are even people on the street who just want to charge you as much as they can. Travellers should know about these tourist scams and safety hazards before traveling to Vietnam. As a traveler, water safety is a very serious issue. Like many other countries, Vietnam has an underdeveloped water treatment infrastructure in place. Contaminated water is a major source of illness so it’s very important to understand what you are getting into. In Vietnam, avoid tap water as much as possible and only drink bottled water. Generally, even locals will avoid tap water and will drink boiled or filtered water at home. Bottled water is almost always available for sale at any local restaurants and hotels. 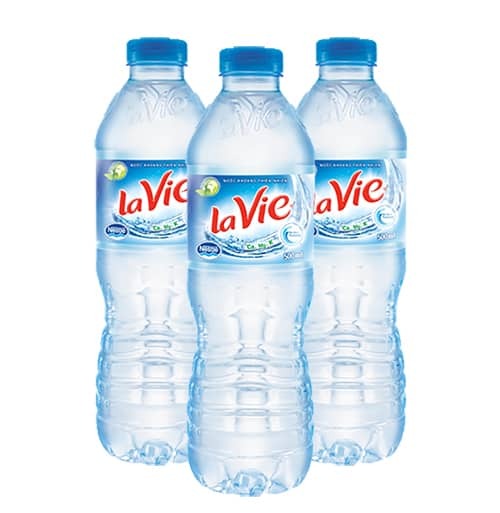 Some brands that are popular and safe include Aquafina, Lavie, Vinh Hao, and Dasani. 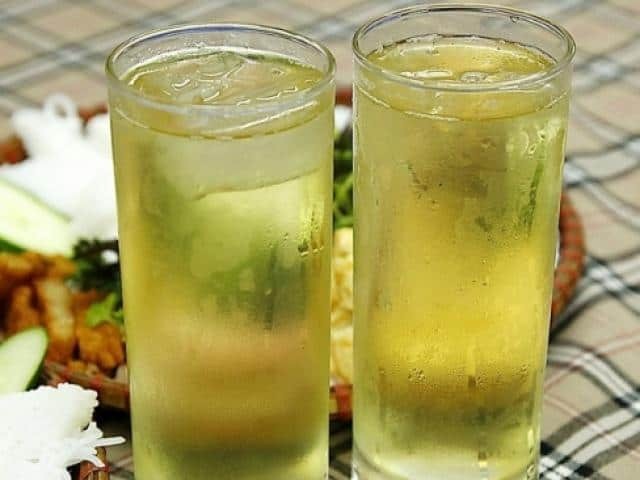 For a refreshing alternative to water, try Vietnamese iced tea (“tra da”, pronounced “cha da”), which is cold green tea with ice. Since it is a tea, it has been steeped in boiling water and then cooled, thereby killing any critters that may make you sick. Most locals will drink ‘tra da’ at restaurants over water simply because it’s safe, more refreshing than lukewarm water, and cheaper than anything bottled! As for the ice, use your judgment. Yes, ice outside may not be safe because it may have been made with contaminated water. However, many restaurants buy ice from companies rather than manufacture it themselves, in which case it is quite safe. Many people, both locals, and foreigners, are able to enjoy drinks with ice in them without consequence. Food-borne illness is also a major concern for travelers, so the meal you eat should be hot and completely cooked! Food restrictions are easily satisfied. Soup-like dishes are ubiquitous in Vietnamese cuisine so there are many opportunities to contract some sort of illness. Make sure that the bowl of Pho that you order is piping hot! Even eating salads and raw vegetables are not the best idea. Adding raw herbs to your hot pho is usually fine but again, you will have to use your judgment. Note that restaurants will flash boil the raw vegetables and herbs for you at your request. Be cautious of fruit – eat fruits that have an inedible skin (i.e. bananas, oranges, watermelon, etc.) and avoid fruits like apples and sugar cane. A lot of travelers ask about street food in Vietnam. Is it safe to eat? Will I get sick? The answer is not so simple. For instance, our XO Foodie Tour takes you to street stalls and open-air restaurants where the food quality and safety procedures have been thoroughly scrutinized and held to high standards. Here are some things that may help make your decision when considering other street food stalls. The turnover and volume at the street stall is an important consideration. The more people who frequent a stall, the fresher the food will be. A lot of these stalls do not have a means for refrigeration so they seldom prepare food ahead of time. 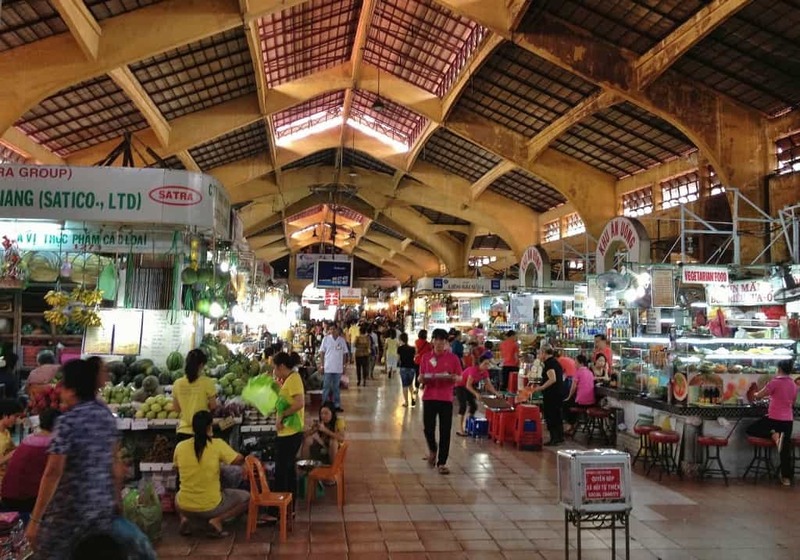 As an example, the stalls inside Ben Thanh market serve a very high volume of customers so a lot of their prepared food gets consumed on the day they make it. That is not to say that you will avoid getting sick but the risk is less. The street-food stalls in Ben Thanh market see hundreds of visitors a day so they tend to go through their food quite quickly in comparison to other street-food stalls in other areas. You can also observe the hygiene at the street stall you are considering. In many cases, you can see your plate being made and if it’s not up to your standards, it is not worth the risk. Be observant of the vessels they use. If you see them wash the bowls or plates in tap water and they are still wet when putting your food in it, maybe this isn’t the street stall for you. For this very reason, “banh mi” (Vietnamese sandwich) is one the safest street stall foods you can eat because there are no vessels or utensils involved! If you really want to eat street-food during your time in Vietnam, reviews from other travelers may be a good source – if many people go to a particular establishment and none of them has become ill, you may get lucky as well! We’re very proud to offer our customers the safest insured-motorbike tour in Vietnam! Ho Chi Minh City is not overly polluted but you can still feel the difference in air quality when compared to other cities around the world. Protection against air pollution is a must when your body simply isn’t accustomed to it. If you are spending a lot of time on a bike, you may want to don a mask to protect against dust and pollution. This is useful if you are going to spend several hours on a bike on a regular basis such as long rides across the country. For shorter bike rides like on any of the tours offered by XO Tours, you will be just fine without one. Pollution and dust can also affect your eyes so definitely wear sunglasses or goggles on these long rides because your eyes can start to burn. 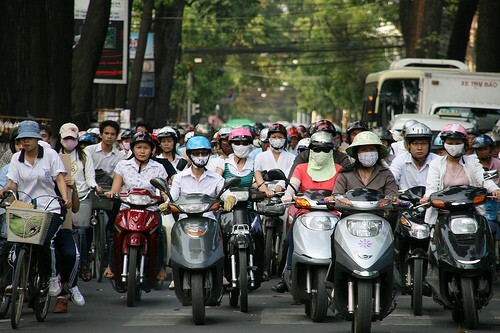 Many motorbike riders in Vietnam wear masks to protect against dust and pollution. As trivial as it may sound, many people get concerned about how to brush their teeth and if tap water is safe for brushing. As we discussed earlier, tap water may be contaminated so it is not safe to ingest. Here are tips on how you can go out this everyday task and still stay safe. For extended stays, brushing your teeth with tap water is said to be a good way to get used to the local bacterial fauna. 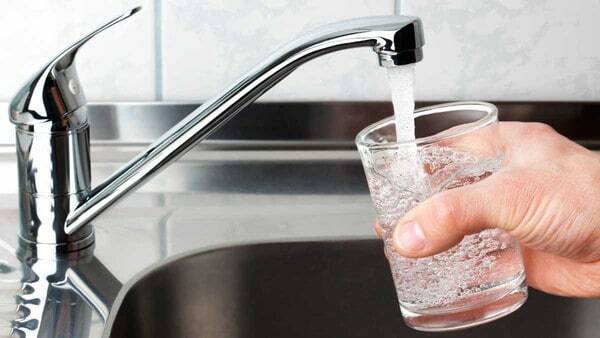 Many tourists brush their teeth with tap water successfully without getting sick. Again, this is only worth it if you will stay in Vietnam for a longer period of time. You may also want to check at the front desk of where you are staying because many of the higher end hotels have an internal filtration system. Keep in mind that the goal of this filtration is not to make the tap water safe for drinking but marginally better so that small tasks like brushing your teeth are hassle-free. With much of Asia being in a tropical climate, it is important to consider sun safety and insect protection. The sun rays are very potent so please protect yourself with the use of a hat and strong sunscreen. 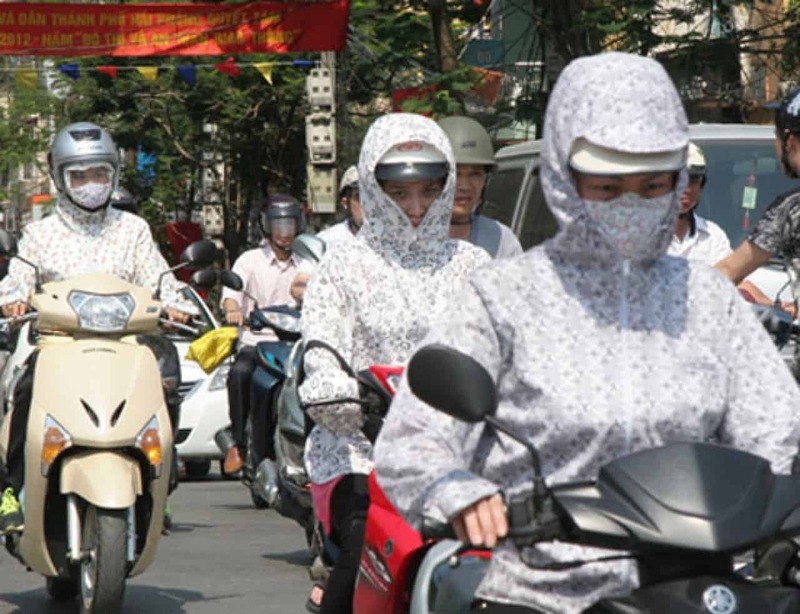 Vietnamese ladies cover their body to avoid sunlight. As for insect-transmitted diseases, malaria and dengue fever are the two you should educate yourself about. In Vietnam, the prevalence of malaria is contained in rural areas but dengue fever is more common throughout the country. 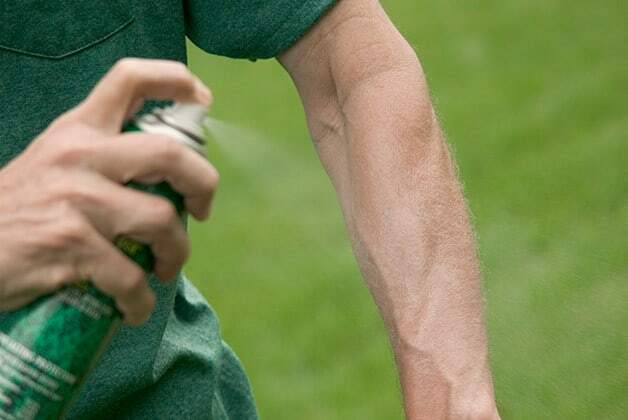 Both are transmitted by mosquitos so an insect spray that contains DEET is a must! 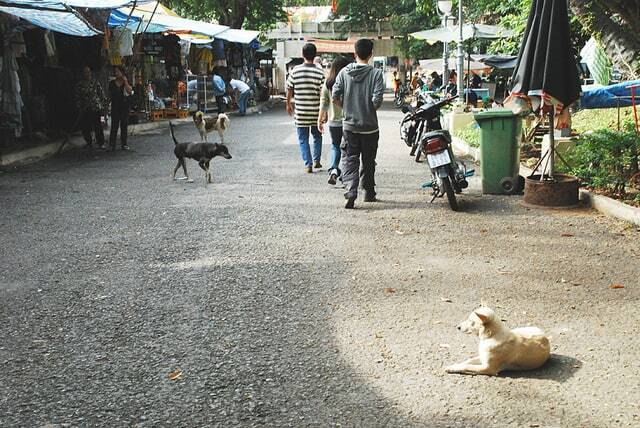 One feature about Vietnam you may find different than other countries is the number of stray animals. As you travel around, you’ll see dogs, cats, chickens and more. An incredibly important point for you to be aware of is that Vietnam is not a rabies-free country. Besides rabies, there are many diseases transmitted through animals. It is imperative that you do not touch or pet any of the stray animals, no matter how cute they are! Stray animals are commonly found out and about on the streets, but it is best to not pet them or come into contact with them. Want a worry-free tour? Our Friendly Vietnam Tour Guide will keep you safe on sound! Hi, im travelling to vietnam/ ho chi ming city in sept this year 2014. I have Addisons disease, which is life threatening. If I get sick from anything, ie: food, contaminated water etc, i have to self inject a solu=cortef injection..and go on intravenous fluids. I was wondering what hospitals are near ho chi minh and in the south of vietnam, if something goes wrong, i need to know what medical help there is, and if i can easily access 100 mg of hydro cortisone to save my life if necessary. Please contact Family Medical Practice. They have branches in Ho Chi Minh City, Danang and Hanoi. They will be able to answer your specific health questions. Good luck! Can’t you bring the cortisone? My grandson is allergic to peanuts and although he is little, age 5, he WEARS, his auto injector on a belt around his waist. I am going to Viet Nam also in October and will take an epipen as I am allergic to bee stings and also shellfish, so I always carry it on me. Are there any shops in Ho Chi Minh City that sell travel guides in English as well as city maps? I am going to travel to Vietnam in a couple of week’s time. Please tell me which vaccinations should I get? Should I get Hepatitis A and Typhoid vaccinations? Hi there. When people tell you ice manufactured in the factory is cleaner than self-made ices in restaurants, you should believe it, for the fact is more terrified. 9/10 factory use tap water, containing a high amount of detergen to make the color better, and AREN’T tested by the gorvenment. Ice tea is about 10% tea ( i dont know where the tea comes from), and 80% tap water, 10% water from melting ice. The tea flavour is added just to soo away the awefull taste of chlorine(which is overabused ) in water. Trust me, you shouldnt have anything with ices, if you fancy of smth cooling, find the nearest convenient store ( cirkle K, shopngo…) and buy one of the 1.5l Lavie or Aquafina. Your comments on tap water are correct but simplistic and could be misleading. You focus on microbial contaminants but neglect to mention organic, metallic and general industrial pollution. These are NOT removed by filtration, chlorination or boiling. I am traveling to Vietnam in a few weeks I am allergic to fish, although I can eat shell fish. Which soups should I steer clear on land. I am on a cruise so not afraid to eat while on the ship. If you’re allergic to fish sauce, this going to be a big problem since most Vietnamese dishes contain some fish sauce. Even basic soup dishes like Pho and Bun Bo Hue is flavored with a little fish sauce. My husband and I and our America born teenage children will be traveling to Vietnam for the first time. Is it safe to eat the fish sauce and lettuce that comes with spring rolls, rice dish, or Banh Xeo (crepe)? Also friends told me to buy bottled water only from supermarket and not from street vendor or small stores. What do you think? Eating fish sauce is fine. Most Vietnamese dishes are marinated with fish sauce or offered with a dipping sauce made with fish sauce, so it will be almost impossible to avoid eating it in Vietnam. It is also safe to buy bottled water from street vendors and small stores as long as the bottled is still sealed. In the many years I have lived in VN, I have never encountered fake bottled water. I would be careful about eating lettuce and pre-cut fruits however since they are not always washed. Thank you for your reply. What about lettuce, tomato, and precut fruits in a hotel or higher-class restaurant? Also, is cooked meat and seafood safe to eat in Vietnam? We are thinking of a joining a tour and eating in restaurants only and not street vendors. Your advice is appreciated. If you want to be absolutely safe, I would avoid the uncooked vegetables or precut fruits in any hotel also. Sanitary standards in Vietnam are not anywhere close as to what you would probably find in your own country even in high end hotels. Many of the staff are not used to washing their hands carefully after using the restrooms. Hi Brinda, I am in Vietnam next month and am wondering about Vegan/Vegetarian food availability and options. If they say its Vegan or Vegetarian, is it really? Or do they still put in fish sauce? Thanks for your guidance. May I ask where will you be visiting? Due to the national religion of Vietnam is Buddhism, we have a lot of vegetarian restaurants and from my experience, they will not put the fish sauce in the food at these restaurants. 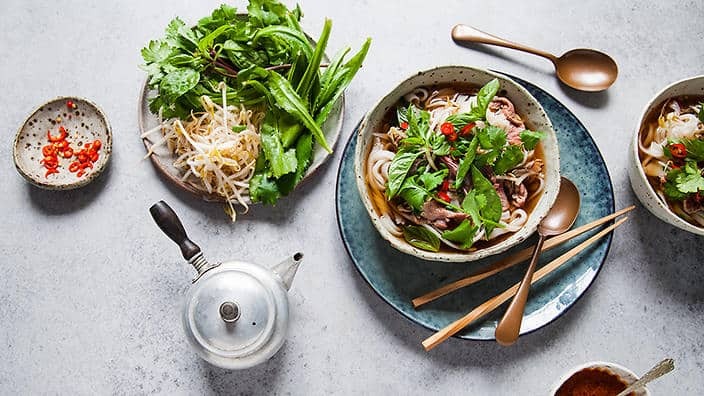 However, I can’t speak for every restaurant, So we would recommend you here some of the trusted vegetarian places in Ho Chi Minh and it would not hurt if you can reassure with them there’s no fish sauce in the dishes. If you visit somewhere else we also can find some great vegan places for you. I’m travelling to Vietnam next week, and I’m a limited worried about my allergy to tomato. I always carry my EpiPen , as I would asphyxiate if I ate tomato. I would appreciate, could you let me know, is there any kind of dish I should avoid? Any that is safe? If anyone could help me with a sentence in Vietnamese I can take written with me to show at restaurants and so, explaining I can’t eat tomato I would appreciate so much!! 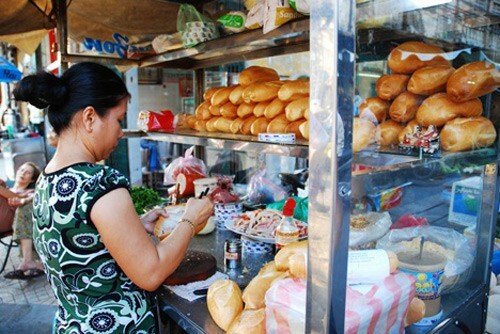 Hi Nuria, you can show the vendors or restaurants the sentence: “tôi bị dị ứng với cà chua”. It means: I have a tomato allergy. Hi Brinda and XO team! I’m considering moving to Vietnam. However, my uncle who lives part-time there has severely disuaded me and his reason was contiminated food. Although food safety is a real issue in Vietnam, we do not believe that this is an endemic problem. Vietnam attracts around 15 million travelers per year, and has a large expat population also, and rarely do we hear from people that get sick from eating the food in Vietnam. We believe the problem mostly exists in the poorer regions of the country and in general the food in Vietnam is safe to consume. When you eat outside, I would recommend choosing restaurants or food vendors that are crowded. It’s unlikely that their businesses would be successful if people that eat there get sick regularly.